The craziness of UFC 230 continues to surprise us all. Earlier today (Oct. 19, 2018) news arrived that Luke Rockhold had been forced off the card due to injuries. Rockhold, 34, was scheduled to fight former middleweight champion Chris Weidman. The two were set for a rematch in the co-main event of UFC 230 in Madison Square Garden on November 3. That, however, will not be happening. *His left shin is infected again. He just got a stem cell graft put in. *He sprained his right knee yesterday. MRI is scheduled for tonight. *He broke his nose recently while grappling. Rockhold said he tried everything in his power to make it to MSG but, “I need at least one weapon to make it the party.” He’s hoping the recovery will be 4 weeks and he’ll be able to return in late 2018/early 2019. It’s unknown if Weidman will remain on UFC 230. 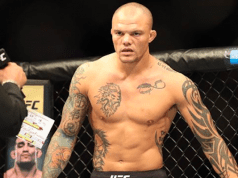 The UFC is reportedly working on finding him a replacement opponent for the card. 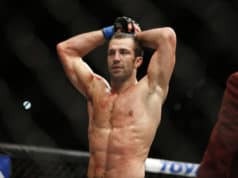 Either way, this is a major setback for Rockhold who was looking to rebound from a devastating KO loss at the hands of Yoel Romero this February.